South Korea says North launched a new Hwasong-15 ICBM which can fly over 13,000 km. The Hwasong-15 missile that North Korea launched on Wednesday is a new type of intercontinental ballistic missile which can fly over 13,000 km (8,080 miles), a South Korean defense ministry spokesman told Reuters on Thursday night. Pyongyang said following the launch that it had test-fired its most advanced missile, putting the U.S. mainland within range. The isolated country also declared itself to be "a responsible nuclear power" and said its nuclear weapons were developed in order to provide protection from "the U.S. imperialists’ nuclear blackmail policy and nuclear threat." The latest provocation from the North prompted more insults from U.S. President Donald Trump, who referred to North Korea's leader Kim Jong Un as "Little Rocket Man" and a "sick puppy". Trump had also dismissed a Chinese diplomatic effort to rein in North Korea's weapons program as a failure on Thursday, while Secretary of State Rex Tillerson said Beijing was doing a lot, but could do more to limit oil supplies to Pyongyang. Despite international condemnation and sanctions, North Korea has continued on its path towards developing a nuclear-tipped missile that could hit the United States. 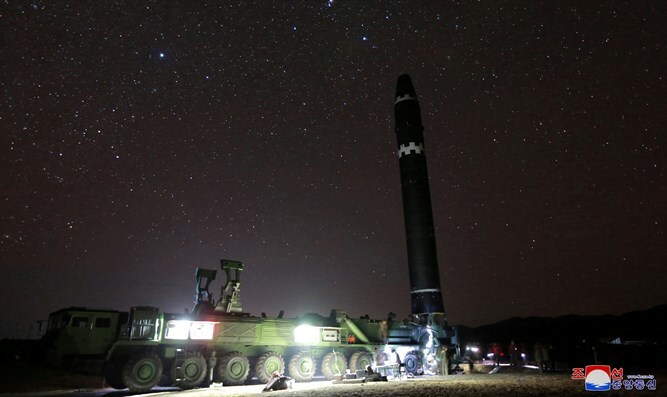 The country had on Thursday released video footage and photographs of the Hwasong-15, which analysts said appeared to show the North was indeed capable of delivering a nuclear weapon anywhere in the United States and could only be two or three tests away from being combat ready. On Wednesday, U.S. Ambassador to the UN Nikki Haley warned that North Korea's latest ballistic missile launch "brings us closer to war" and added that if war comes as a result of further acts of "aggression" like the latest launch, "make no mistake - the North Korean regime will be utterly destroyed." Wednesday’s test was the latest in a series of recent provocations by North Korea, which has several times in recent months tested ICBMs in violation of UN resolutions. Its first such test occurred on July 4 and triggered global alarm, with experts saying the missile had a theoretical range that could reach Alaska.